Lambeth Palace Rd, London SE1 7LB. 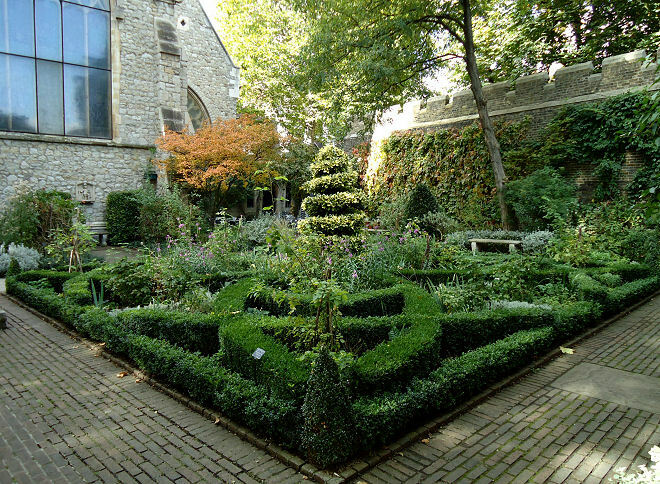 As topiary gardens go this is small but it is an oasis of calm amidst the traffic that rushes down Lambeth Palace Road and across the bridge from Westminster. If you have come across the bridge from the direction of the Houses of Parliament be careful crossing the road as it is not easy and seek out the lighted crossing on the left hand side as you approach. 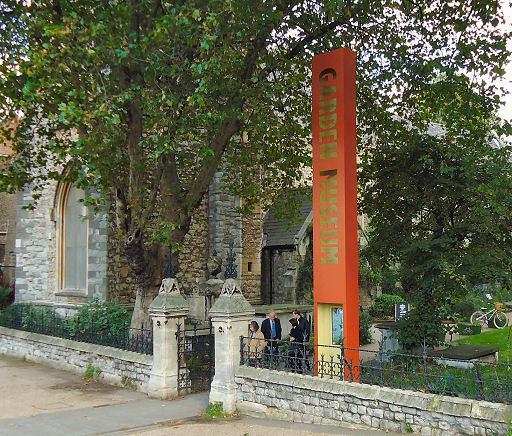 The Museum itself is in the former St Mary at Lambeth church which is literally right next to Lambeth Palace, the official home of the Archbishop of Canterbury. 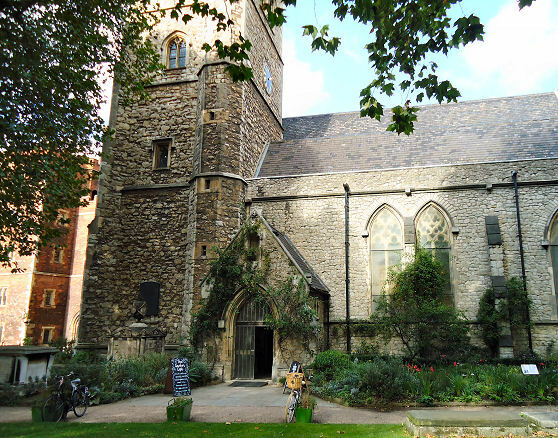 Considering this is an important area for the church it is odd that in 1972 it was deconsecrated and plans were drawn up to demolish it in 1976. Although what you see today is largely a victorian reconstruction it looks like a proper church but it is its history which was its saviour. 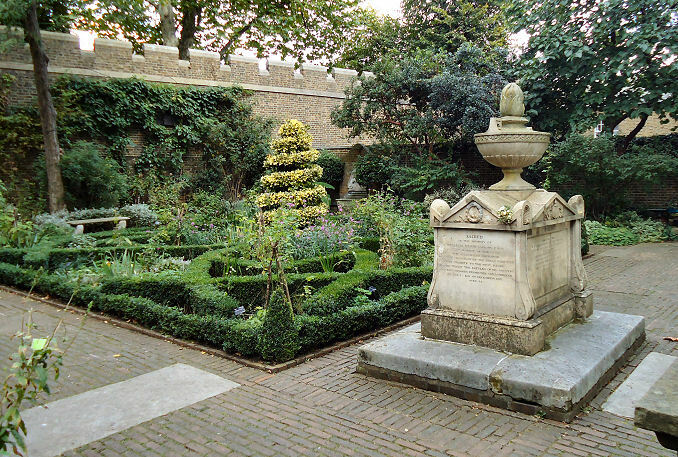 John and Rosemary Nicholson traced the tomb of two famous seventeenth century plant hunters John Tradescant father and son to its churchyard, and were thus inspired to create the world’s first museum dedicated to gardening in the building and the grounds. 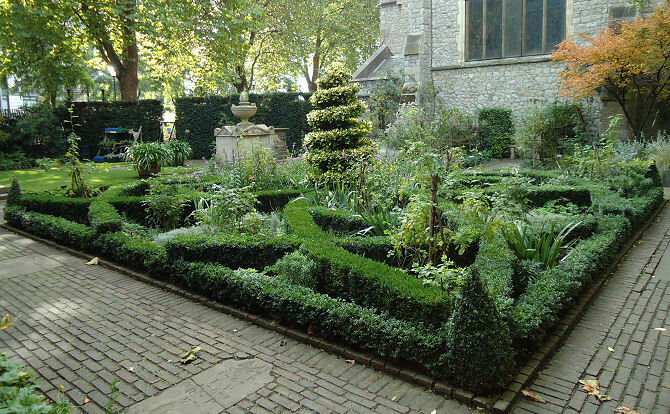 The garden was laid out in 1980 with the seventeenth century knot garden as its centrepiece. This was designed by the President of the Museum, The Dowager Marchioness ofSalisbury herself famous for restoring the gardens at Hatfield House in Hertfordshire). 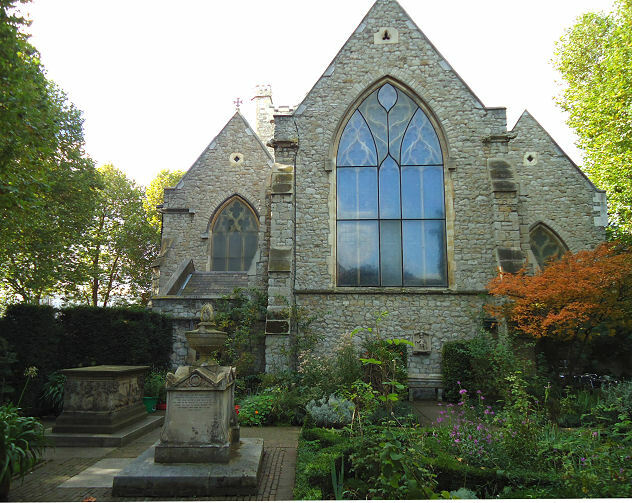 The presence of the graves of John Tradescant and his son both royal gardeners and famous plant hunters inspired the desire to have a seventeenth century feel. The knot garden formed of box and the rest of the garden are planted with species introduced to this country by the Tradescants. Here you will find a red maple and tulip tree as well as smaller planting. Indoors there is a permanent exhibition which opened in 2008 of garden implements and plant hunting history and the other parts of the building house special exhibitions which change three times a year. There is a thriving cafe indoors with some seating outdoors which is popular with nearby office workers as well as garden enthusiasts. There is also a shop where you can buy books and other items to tempt you. Incidentally there is a charge for the museum and grounds but the cafe and shop are free. You are given a sticker to say that you have paid and as the museum is largely staffed by volunteers it would not be right to sneak into the garden as a cafe customer for free as I have seen intimated elsewhere on the internet! Your money counts to keep this vital piece of heritage functioning and it is estimated that at least £10,000 a year is needed for the upkeep of the gardens. 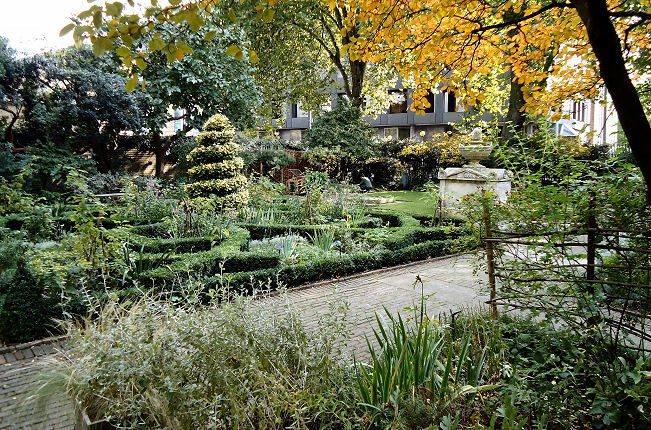 The formal St Mary’s gardens were created in 1932 outside the church at the same time as the new bridge across the Thames was built. In olden times you would have gone across the river from Westminster to Lambeth on a horse powered ferry. 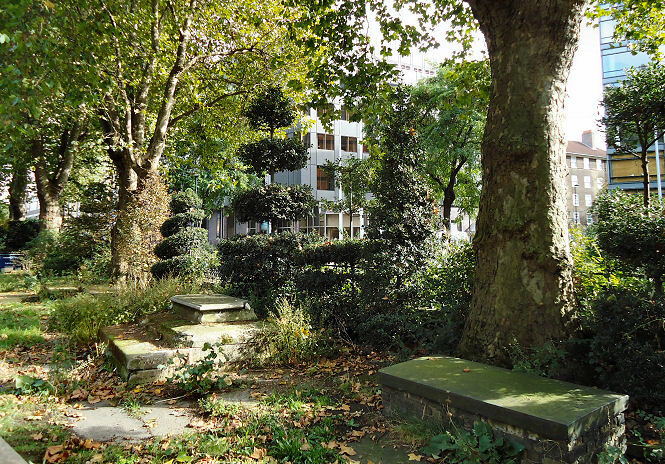 The gardens were restored in 2008 by the Friends of Archbishop’s Park. The design and the planting are said to reflect the pattern of the surrounding fields which were all around at the time of the Tradescants. All photographs by Anthony Blagg The United Kingdom too small for you? Topiary Today covers the rest of the world including some of those fantastic Italian gardens.